A portable pipe milling machine that sets up fast and provides precise, perfectly square bevels on either torched off or rough cut pipe for better weld integrity is available from Esco Tool of Holliston, Massachusetts. a self-centering draw rod assembly which fits into the pipe I.D. and has a mandrel with expanding clamps for rigid mounting. 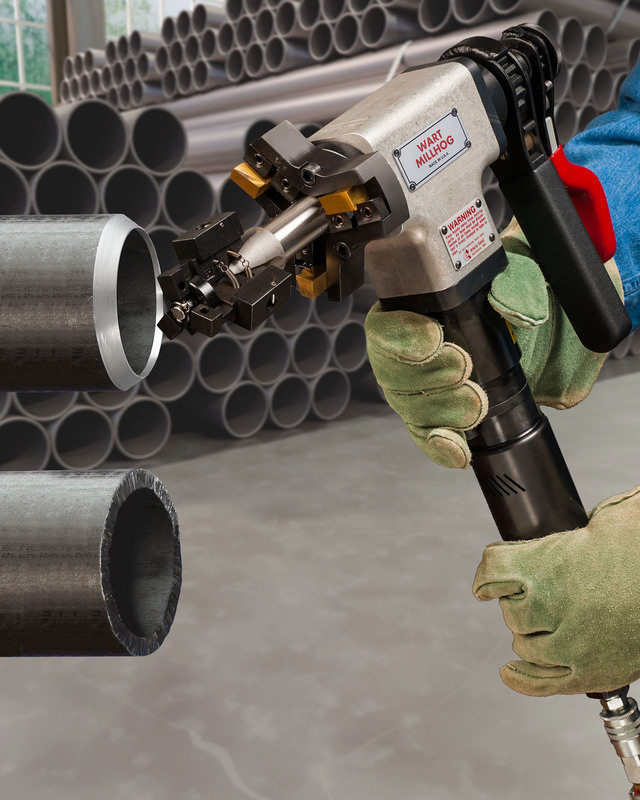 Designed to enhance weld integrity, this tool can bevel, face, and bore simultaneously with ± 0.001” accuracy to provide perfectly square pipe ends featuring any angle of prep. Suitable for tube and pipe from 0.750” I.D to 4.5” O.D., the Esco Wart MILLHOG® runs at 98 RPM which makes it ideal for highly alloyed materials or carbon steel. TiN coated blades are offered in a wide range of styles and no cutting fluids are needed. Designed with highly reliable dual opposed taper roller bearings, it is available with pneumatic and electric motors. The Esco Wart MILLHOG® is priced from $5,595.00 and is available for rent.